An Arm Lift, also called a brachioplasty, is a surgery done to reshape the under portion of the arm from the axilla to the elbow. Why do people choose brachioplasty? Many people experience a drooping, sagging appearance to the underside of the upper arms as a result of changes in weight, aging, and even as a result of heredity. Both men and women can find themselves very self-conscious of sagging arms and feel unable or unwilling to wear sleeveless shirts or even to raise their arms during daily activities in public. While exercise may strengthen and improve the underlying muscle tone of the upper arm, exercise alone cannot correct excess skin, localized fat deposits or underlying weakened tissues. When faced with these sagging arms after attempted exercise and weight loss then surgery is the only answer to reshape the upper arms. To perform an arm lift, Dr. Armenta will create an incision on the inside of the arm to hide the scars as best as possible. 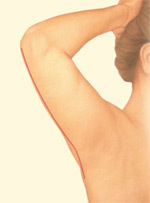 Incision length and pattern will depend on the amount and location of excess skin to be removed. 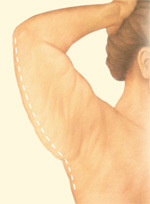 During an arm lift, fat may be removed through liposuction if needed or may be removed surgically. The supportive tissue are then tightened and reshaped with internal sutures. Finally, the excess skin and fat are removed and the incisions are the closed in a meticulous and careful manner. These steps will leave your arms much smaller and smoothed to compliment your new look. What can I expect from brachioplasty? Brachioplasty reduces excess fat and skin from the underarm to the elbow and reshapes your arm for more a proportionate and toned appearance and smoother skin. In order to achieve your improved image, there will be a scar on the inside of your upper arm which most patients find preferable to drooping, sagging arms. Patients who maintain their weight and general fitness will enjoy long-lasting results from an arm lift. How can I learn if brachioplasty is right for me? If you’d like to make an appointment for a consultation to learn whether brachioplasty is right for you; contact Dr. Art Armenta’s office. Dr. Art Armenta is a Diplomat and certified by the American Board of Plastic Surgery and is a member of the American Society of Plastic Surgeons.